I love these little gems. I love the fact that they really work, that they're available in pharmacies, that they're really not expensive at all. They get a huge amount of love from bloggers and MUAs, and I can see why. This is a (wonderfully) completely scentless body moisturiser/body cream, suitable for all skins but really particularly suiting normal to dry or very dry and sensitive skins. A water-based light cream formulation, and containing glycering, cocoa nut butter and natural plant lipids, this claims that it's gentle enough to be used on teh face as well as the body. Did I try this claim out? I did, and I would probably advise against it unless you have severely dry skin or particularly dry/mature skin - personally, even with my dry skin of late, I found it a little too heavy feeling for my face. Despite a lack of any silicones or trickery, it leaves a lovely silky feel to the skin, probably down to the glycerin listed close to the top of the ingredients listing. I loved it on my shins, dry from months of wearing heavy 1 million denier tights. I loved it on my hands (not at all greasy or annoying). I loved it in particular on my elbows, which it smoothed out for a number of days subsequent to its single use. This brand is available in Boots and at only around the tenner mark for 75ml, is a really affordable and brilliant body cream that really really works. Very highly recommended. Although I don't use this myself regularly, I've been known to break into the OH's stash from time to time (at least once a week) and sneak some of this stuff. It's as brilliant as the body cream, but entirely aimed at the face (personally I prefer this one on the face). 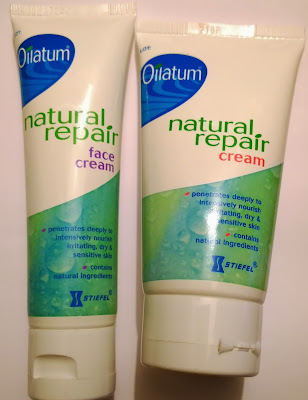 Containing similar enough ingredients to the body cream (some slight differences) but still no silicones or other "trickery" ingredients, this is also a light cream formulation and you really don't need to use much of it - a small petitpois/baby pea sized amount is absolutely more than enough. Although it feels slightly greasy on application, this fades after a minute or two, leaving soft nourished skin behind (I would give it a minute or two before applying foundation on top if it though). This is also in-or-around the tenner mark from Boots for 50ml and is also perfect for combination down as far as very dry & sensitive/sensitised skin types. This is also scentless (something I love in skincare products, but is really hard to find). My OH loves it for its lack of scent and for its impressive efficacy, transforming his dry and unhappy sensitive skin into something a bit more soft and healthy looking with ne'er a trace of a flake anywhere. Free from fragrances, preservatives, emulsifiers, parabens, alcohol or silicones. This stuff is really good, it works, it doesn't cost an arm and a leg, and it's easily found in local pharmacies/drugstores. What's not to love!